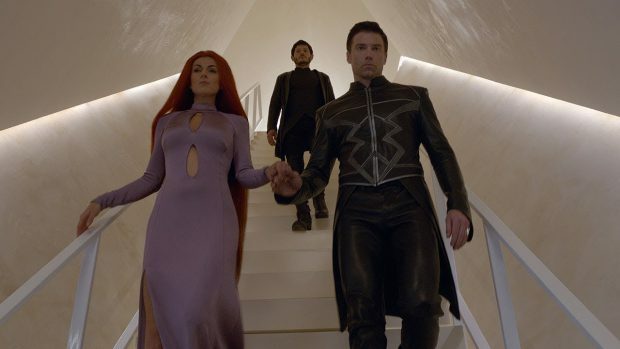 Marvel’s Cinematic Universe expands once again with a joint venture between ABC and IMAX to bring us Marvel’s Inhumans; a short run TV series about a group of superhumans living on the Moon. 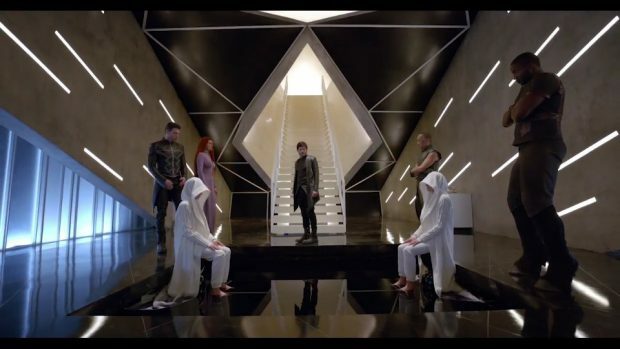 The journey Marvel’s Inhumans has taken to get onto screens is an interesting one. It started life as one of Marvel’s movie projects and was eventually changed to a small screen 8 episode miniseries with the first 2 episodes playing in IMAX. I found the change more interesting than the film as I find TV a far better medium for superheroes since there’s a lot more time to develop the characters and explore the nuances of their relationships as well as the overall story. Of course the budget for visual effects and spectacle is far less but for me, story and character are always far more important so it’s not such a big deal that there might be less elaborate set pieces. This is a TV show and I focus more on analysis when doing my TV reviews but the episodes shown in IMAX are presented like a film which makes it something of a hybrid. As such my review will be something of a hybrid so expect some analysis but not to the same degree that can be found in my usual TV reviews. There will be spoilers as well so be warned. Without going into too much detail, the Inhuman Royal Family in the comics are a really interesting collection of characters. They’re a family first and foremost and many of their conflicts are connected to relatable familial ones such as sibling jealousy. This is combined with a very theatrical presentation that borders on the Shakespearean as there is betrayal, punishment and themes such as greed and the all consuming desire for conquest. Basically the Inhumans are often portrayed as larger than life, otherworldly figures with a way of life similar to ours but different enough that it appears somewhat alien. This series appears loosely based on the early conception of the characters where a coup has the Royal Family removed from power in the name of social change. The motivation for this appears to be founded on jealousy more than anything else though there is an undercurrent of making things better for those not blessed enough to be royalty. 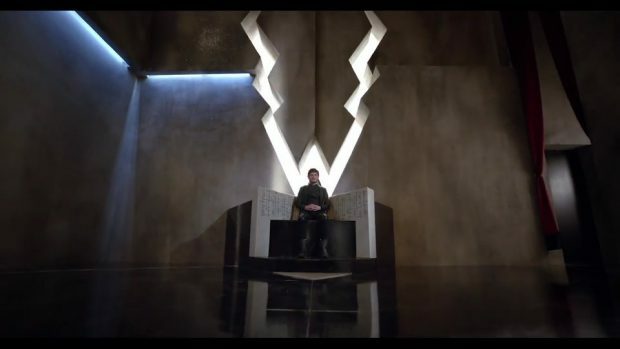 Marvel’s Inhumans introduces audiences to Black Bolt (Anson Mount), his wife Medusa (Serinda Swan), Karnak (Ken Leung), Gorgon (Eme Ikwaukor), Triton (Mike Moh), Crystal (Isabelle Cornish) and Maximus (Iwan Rheon). Together they make up the Inhuman Royal Family and they are established as being a peaceful people living on the Moon to be removed from Humans on Earth who they think will hate and fear them. The early scenes establish their home, Attilan as something of a peaceful Utopia if you happen to be on the right side of privilege. Medusa talks to her husband Black Bolt about the burden of being Royalty in an early scene and it takes a while before we’re told of the caste system and those less fortunate who are made to toil in the mines. Considering this is at least part of the reason for Maximus’ plan to overthrow his brother it’s surprising that more isn’t made of this idea. This was an opportunity for a Marvel Cinematic Universe project to explore the impact of a privilege based class system on a society. It’s on a much grander scale with the Inhumans being superpowered people but the underlying idea is something that people can easily relate to since that’s how our society albeit in a slightly different way. Inhumans get their powers through Terrigenesis; a process introduced in Marvel’s Agents of SHIELD. Effectively the process unlocks the potential inside someone and lets them become their true selves. It’s a clear metaphor for puberty and growing up in general while also being legally distinct from the Fox owned X-Men franchise. We see this process carried out on a young man and a young woman. It is depicted as a ceremony with the suggestion that it is something that has to be earned in some way or is at least performed at a certain point in life. The woman gains wings like a butterfly and is granted the power of flight as a result where the man isn’t given any obvious power to begin with. It becomes clear to Maximus that he can see the future -something also explored on Marvel’s Agents of SHIELD– which gives Maximus all the motivation he needs to begin his coup. Once the process of Terigenesis has been completed it ties into the caste system significantly. The woman’s ability to fly is celebrated and it seems to elevate her standing in society in some way where the man is resigned to toil in the mines with the implication being that he isn’t considered special enough to do anything else. It’s really interesting stuff and hints at a tense situation that has been building for a long time but these episodes do absolutely nothing with it other than establish it as a background detail. It’s possible that more will come of it in the coming episodes but I would think that the first episode would make it clear that this would be a major theme throughout the season. Maximus’ coup attempt is underwhelming -a word that could be used to describe much of this- to say the least. The show does good work establishing him as someone who is unsatisfied with his way of life. He openly disagrees with Black Bolt about his decisions and is clearly concerned about the future of their race given how close to discovery they seem to be by Humans. There’s also the fact that Terrigenesis didn’t give him any powers so he is forced to live life as an ordinary Human, fully aware that the only thing keeping him out of the mines is that he is brother to the king. On paper he’s an interestingly complex villain with his motivations and the reasons for them clearly stated but it doesn’t quite add up when presented on screen. The main issue is that his decision to take over doesn’t come across as profound. He is given vague information about his future and the decision to act on it is very much a snap decision rather than his dissatisfaction and insecurities taking him to a breaking point. A decision made by Black Bolt should have been the catalyst for his actions. It is to a degree but it’s unclear that his actions are fuelled by him thinking his brother has taken things too far. Iwan Rheon does a really good job playing Maximus. He doesn’t have a lot to work with and his dialogue is somewhat questionable at times but he successfully brings across Maximus’ duplicitous and insecure nature. He lacks chemistry with any of the other actors but this is true of the entire cast so it appears to be a problem with the direction of the actors rather than the actors themselves. The show has a built in problem with Black Bolt. That problem is that the character doesn’t speak. His super power means that the merest whisper could be devastating to those around him so he doesn’t talk. This means that any conversation he’s involved in involves him using sign language while one of the other characters translates this for the audience. Considering the limitations of having a character who can’t express themselves through speech the show does a fine job with Black Bolt. 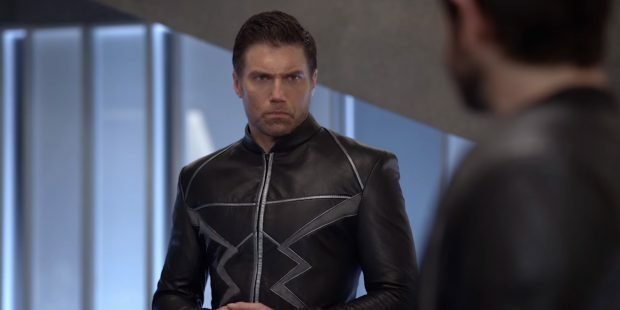 Anson Mount is very expressive when it comes to his body language and facial expressions so it’s often clear what he is thinking through watching how he reacts to a situation. This doesn’t always come across due to the execution of the scenes from a technical standpoint. Some scenes might as well amount to Black Bolt winking at the audience with a comedic shrug though others work very well such as Black Bolt silently approaching Maximus and making it clear that his disloyalty isn’t something he’s prepared to tolerate. Interestingly the reason for Black Bolt’s silence isn’t revealed right away which amounts to both a good and bad decision. It’s fine for me because I know why he doesn’t speak but a large part of the screen time has others speak for him with no explanation. It does bring an element of mystery to the character but it’s so awkwardly staged that it comes across as silly more often than not. When the reason is revealed it results in a handful of unintentionally hilarious flashbacks that really don’t hit the intended mark. Despite having dialogue to work with, Medusa is less defined than Black Bolt is. She’s the Queen and her power involves controlling her hair but there’s little else about her to latch onto. It’s established that she came from humble beginnings and that Maximus has feelings for her but Serinda Swan’s performance feels really awkward so there’s never a sense of who she is. There’s a scene where she attempts to come across as intimidating but it doesn’t work and any attempt to inject any sense of regal authority into the performance fails. Karnak is another problematic character. Knowing his abilities in the comics I could see what they were going for here but I imagine it might be confusing to those that don’t know what his powers are supposed to be. The visualisation of his powers being like the Nicolas Cage film Next was interesting but I wish they had been used in more clever ways. Ken Leung’s performance is terrible. It’s almost as if he was reading the lines but had no idea how they should come across so it comes across as a passionless delivery. There are scenes where he’s supposed to be making jokes or sound threatening but the delivery is bereft of any sense of emotion so it doesn’t come across at all. Gorgon is similarly problematic. His role as the muscle of the group and a skilled combatant is reasonably well defined but Eme Ikwaukor’s performance is really disjointed. I get the sense that he’s trying to project a “tough guy” attitude along with effortless confidence in his abilities but this also fails to come across. Crystal comes off worse than the others but it might have something to do with her having more screen time than many of the other characters. I have no idea what they were trying to define Crystal as. Early dialogue suggests that she’s a rebellious youth who shirks responsibilities and isn’t reliable but this doesn’t come across based on what we see on screen. None of the scenes she shares with others tell us anything about her relationship to them other than dialogue pointing out that she is Medusa’s sister. Isabelle Cornish’s performance is distractingly awkward as she fails to engage with any of the material. Any attempt to portray Crystal as mischievous or intelligent yet misunderstood fails and the show does nothing to establish who she is as a person. I’m fairly certain that the character failures comes down to bad direction. I’ve seen many of these actors in other places and their performances were far better so I think they all have the ability to bring these characters to life but the writing and the staging does them no favours and they have very little to work with. the Marvel’s Iron Fist Netflix show has a similar problem -though not to the same extent- so it’s no surprise that they share a showrunner. There are other issues with the story that can be seen throughout. The biggest problem is inconsistency and an inability to properly establish the premise. The Inhumans live on the moon away from Earth and have done so for an undetermined number of years so it makes sense that Humanity isn’t something they understand. Many of them fear Humans and feel comfortable living in isolation. 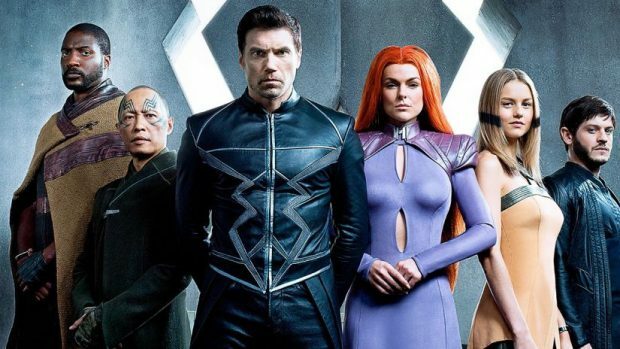 This is well established but it starts to fall apart when the show is so inconsistent with the level of understanding the Inhumans show in regards to Humanity. Many examples of this can be seen throughout such as Medusa knowing what a bus is and understanding its function despite having no reason to. Black Bolt is shown to not understand that walking out of a clothes shop without paying isn’t acceptable and shows confusion when he is being chased. Further confusion is shown when his attempt to fight his pursuers results in this escalating to the point where he is subdued. There’s a really ridiculous scene involving Gorgon interacting with a group of surfers who don’t seem at all phased by his appearance. They behave as if saving drowning Inhumans is something they do all the time and their dialogue basically amounts to “please explain the plot to me”. It’s really bizarre to watch and lifted me out of the story. 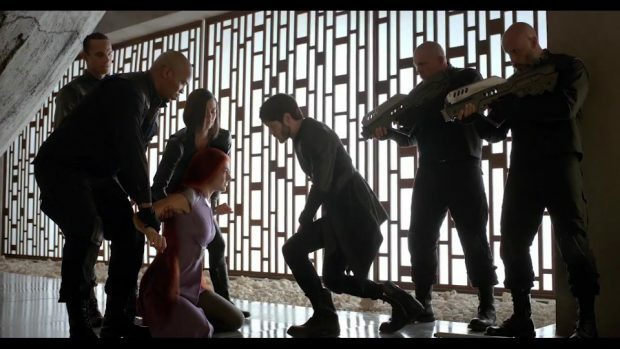 I can see what the show is aiming for when sending the Inhumans to Earth. It’s a lot like the first Thor film where Thor lives on Asgard and is sent to Earth where he is forced to learn how things work in an unfamiliar setting. It’s the same here where the Inhumans are forced to leave Attilan and don’t understand the unfamiliar surroundings they have to make their way through. I didn’t personally like the first Thor film but it executes this idea far better as it’s consistent with what Thor doesn’t understand where this show can’t seem to decide what the Inhumans are unfamiliar with. Visually the show is really impressive. Those expecting movie quality effects will be disappointed but it’s not a movie so I wasn’t expecting that. Attilan looks great from a design point of view, there are many wonderfully rendered shots of the Moon and the visualisation of the powers looks good enough. 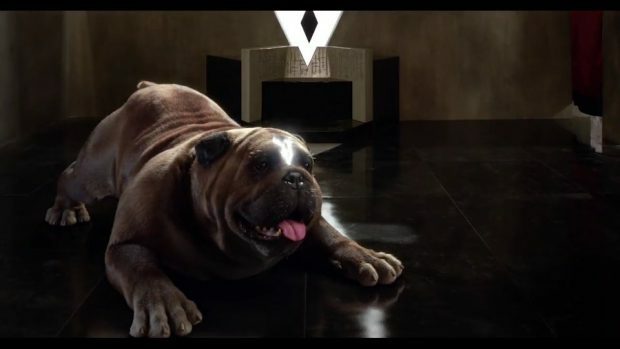 The standout visual is Lockjaw; Crystal’s large teleporting Dog. He isn’t seen often but when he is it looks great and the teleportation effect is really cool as well. Surprisingly this is bereft of any major action set pieces. I mentioned above that spectacle isn’t everything but it should be part of a superhero show in some way. These episodes give us almost nothing which is baffling considering the decision to show these on IMAX screens. There are four small action sequences that I can remember with none of them being particularly well executed. It’s a waste of the medium of IMAX and could be forgiven if everything else was fascinating therefore making up for the lack of action but that is far from the case. Amusingly these episodes manage to remove a lot of the more expensive visual elements before the end credits. Medusa receives a haircut which means that animating her hair isn’t something that will need to be done in many of the coming episodes and Lockjaw is incapacitated which saves money on animating him. I suspect that these elements will return in the finale and I understand why these things were removed from a budget point of view but I can’t see removing Medusa’s one defining trait as being a good idea. 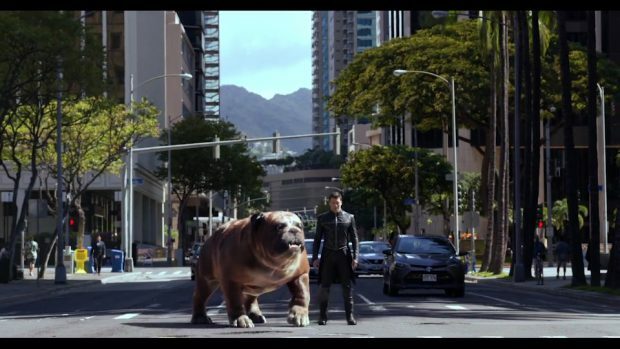 Marvel’s Inhumans is part of the Marvel Cinematic Universe but there are limited references to the wider continuity. The growing population of Inhumans on Earth thanks to the events of Marvel’s Agents of SHIELD is referenced and could become a larger part of the story as the season progresses but there’s nothing else to tie it to the universe. This isn’t a criticism; more of an observation but I am glad that Marvel’s Agents of SHIELD was referenced considering they introduced the Inhumans to audiences. Something of a misfire that has all the ingredients to be something really interesting but fails to use them well. The characters are thin and badly acted, the story itself doesn’t quite work and the lack of consistency throughout makes it hard to engage with the material. The show is impressive on a visual level and some of the ideas established have a lot of potential to be developed but the obvious strengths afforded by the setup aren’t used to any significant degree.